This will hopefully be the first in a string of posts where we are “getting things done” with KidCentral at Central Christian Church. 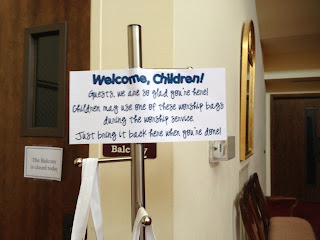 You see, we have, like many of you, had SO many wonderful ideas about how to enhance ministry to, with and for children and families for years, but haven’t always followed through. Today, we are updating our Worship Activity Bags for children. 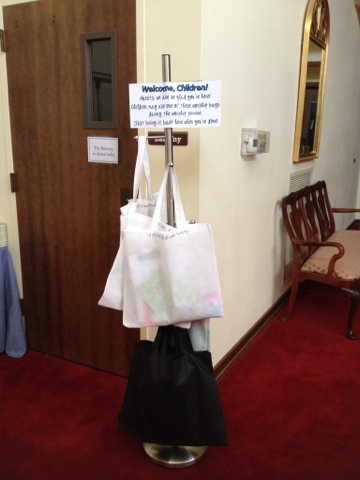 You might call them “Busy Bags.” While I know there are countless resources available of Worship Bags, I was inspired by a ministry colleague who created THESE. 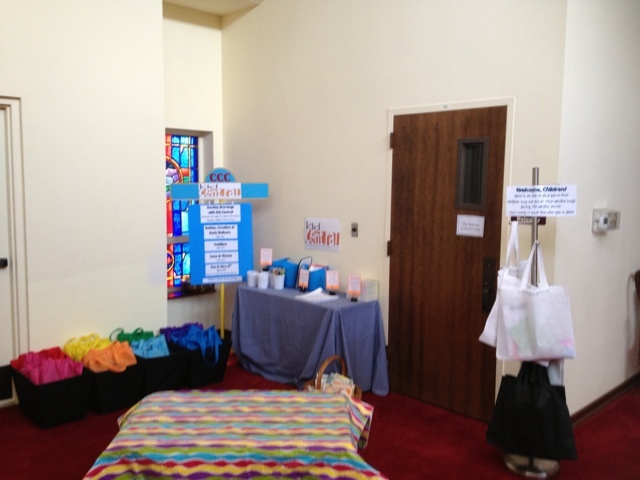 I took her ideas and have customized the bags to my congregation. 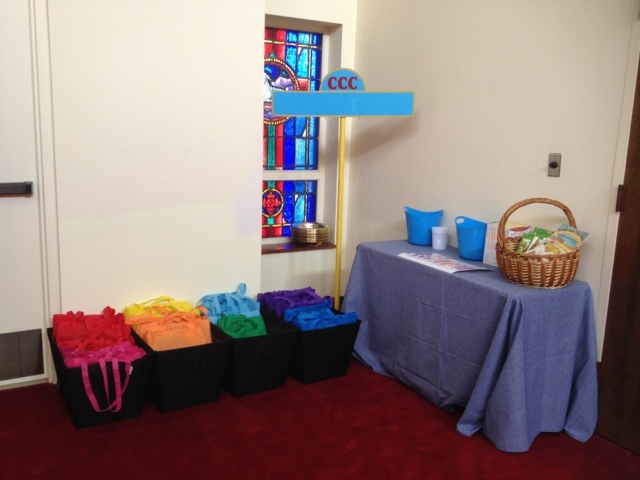 The bags sit in the corner of our Narthex just outside of the sanctuary. 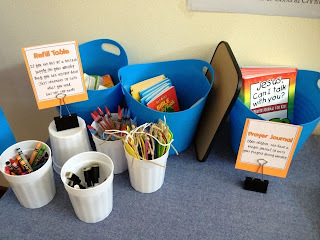 There is a table for “refill” supplies and monthly, I am starting to put out extra theme pages that correlate with our Workshop Rotation topics. For example, kids can pick up word searches, color pages, crosswords, etc., about Moses and the Burning Bush for this month. I have two new servant-leaders who have taken on the task of keeping the bags organized and resupplied. I am finding that about every 6-8 weeks, a good “dump everything out and put it all back” clean out is pretty necessary. 1) They are a visual sign before guests even enter the sanctuary that children are welcome and important in our church. 2) Since the kids have their own bag, it’s less week-to-week work to keep them organized (verses the every-week children’s bulletin). 3) Kids have meaningful activities to connect them to worship (more to come on this–I want to add more specific elements helping to teach kids about the various elements of worship). 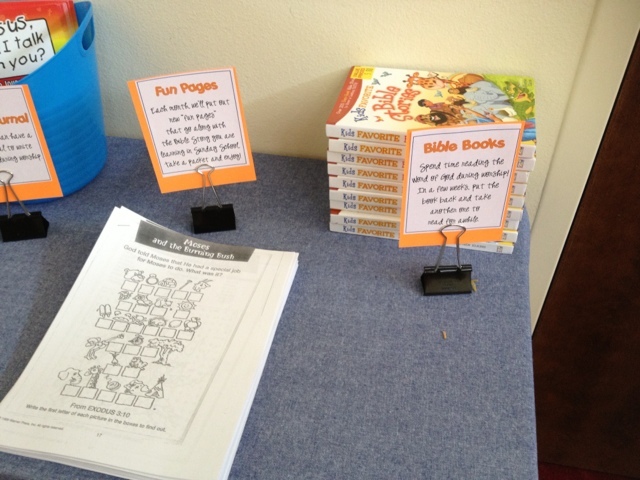 4) They keep the kids busy during worship until they leave for Children’s Church. This helps keep the ratio of frazzled parents to non-frazzled parents low. 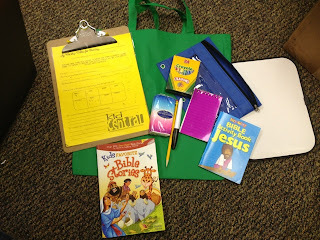 What kind of worship bulletins, activity space, or bags do you use to connect kids to worship? Previous Notes from the book "Collaborate"